All you need is there in the lodge - and the view us simply stunning! Although we were only there for 3 nights, we had an amazing holiday. The lodge had all we needed domestically and the surrounding mountains and loch were stunning. We loved the cycle path - in either direction we were met with incredible scenery and the most friendly people. Back at the lodge, it was only a short walk to the pub, The Creagan Inn, which was beautifully situated at the edge of the loch and staffed by friendly people who made you feel very welcome whether just having drinks or a meal. We definitely want to return to Squirrel lodge. This was the 3rd time we have used the cabins at Appin Holiday Homes and each time we have found them very clean and welcoming with a most convenient location for us. We will probably be using them again later in the year. Disappointed that the busy road was between the lodge and the loch. Disappointed with the space inside the lodge...think the photos make it look mcu bigger than its actually is which was disappointing and left us feeling it was a bit overpriced. Stayed in the Squirrel Drey Lodge as 3 adults and a teenager. Lovely warm welcome from the owners. Excellent location not far from Oban and other attractions. Great little lodge with amazing views of the the Loch and the mountains. Weather was good whilst there but could see the lodge would still have been comfortable in poor weather. Good facilities, shower could be more powerful but that’s being picky, plenty of hot water. Quiet location but the games room had a pool table and Nintendo Wii as well as internet which we seemed to be able to connect to from our lodge. Lovely area for walks. Pub a 5-10min stroll with friendly service, great views and lovely food. Will definitely be visiting here again and recommending to friends and family. The Appin Holiday Home was a perfect holiday home. The location and views were stunning. The rooms were spacious and all the amenities were provided. I would recommend to anyone. It has easy access to both Oban and Fort William and is at almost equal distance to both places of attractions. Again the views were far reaching and changes throughout the day. To have a cup of tea or relax in the evening with the company of the nature it’s the ultimate experience. I would love to go again. There is lots for kids to do and we would go again. Very comfortable, well equipped. Comfy bed, best sleep in ages. Views amazing from the decking area, helped by the great weather. Family are very good hosts and very helpful. Within walking distance of an excellent restaurant/bar. The Lodge was Clean, Tidy, Comfortable and Well Located with a good view of the loch. It was used to serve as a base during a visit to undertake a few days winter maintenance on our boat located near by. We would use it again. what a lovely stay we had, and we even had snow which made it all the better. Lovely view... Quiet site with an exceptional pub half a mile away which does fantastic food and offers a really warm welcome! Each lodge even has a torch provided to allow you to find your way home! A car is essential for getting about but loads to do and see. The guide to walks is an amazing touch and they even give the kids a treasure hunt and guide to den building.... Fantastic! We had four days in a very wet October in a very cosy lodge. Jim and Julie were very friendly and helpful. Our kids loved the stony beach across the road, and we loved the short walk to the Creaggan Inn. Lots of info in the lodge about things to do, but our favourites with 2 young children was the Sea Life Sanctuary, and the amazing waterfalls at Sutherland's Grove both about 15mins drive away. We definitely hope to go back as there's lots still to see and do. The lodge is comfortable tastefully decorated. Views are incredible. Outdoor area is nice with bench and garden furniture on the balcony. There was a games room and outdoor chess which the children enjoyed. This is the third time we have visited and I don't think we will ever tire of the fabulous views and great facilities. The great weather was an added bonus. Hope to be back soon! My stay in Squirrel Drey Lodge. All in all I enjoyed my stay. Very nice stay , comfortable and clean . Great location. Good facilities , but flakey Wi fI , not a real problem though ! The host are soo helpful and wonderful. The area is peaceful and just wonderful staying here. Lot to do in surrounding area. Thanks a lot for your review we are so glad you enjoyed the lodge and its view. Hope the wedding went well! Vue sur le loch superbe et inoubliable, accès aisé, situation entre Oban et Fort william excellente et assez centrale, confort agréable, bon contacts avec les 3 générations des propriétaires, malgré la route assez proche pas de bruit ni jours ni nuits. Liberté totale de circulation dans la propriété, Salle de jeux avec énormément de loisirs accessibles, vidéo films, livres, jeux TV etc. The lodge was very comfortable with nice furnishings and pictures. Thought has gone into how the lodge looks and feels. We were very happy with our stay. Kitchen items ample for breakfast and snacks but cooking a dinner for 4 might be a challenge, but then why waste your holiday time cooking when there are good restaurants and pubs in the area. We found it a lovely place to use as a base - the view from the patio has to be seen to be appreciated. Good standard accommodation in a beautful location. A bit pricey but it was ideal for what we wanted. We spent the Christmas period in the lodge. Which was very warm comfortable quiet & homely. The location is stunning lots of lovely walks to take in the views. I imagine in the summer there is even more to enjoy with boot trips etc. There's a folder in the lodge with very good & detailed information of the area. To us it was Obviously that it's a remote area and so we took everything with us that we needed. The nearest supermarket is a good drive away in Oban app 15 miles. which you'd expect for this kind of location. We did lose our phone signal for 3 days due to a mast issue, and you'd be lucky if you get anything more that a 2G connection, However that wasn't a concern for us. There is a wooden lodge thats a play room come social area. Free wifi is provided it's not the quickest but it works.The family that run the site are genuinely lovely. Nothing was to much trouble. The kitchen was well equipped. We would definitely recommend this site. Great holiday! Absolutely perfect accommodation for myself, husband, daughter, granddaughter and dog. Well equipped with welcoming coffee, tea, hot chocolate etc.Only one small detail.. take towels as we didn't realise they were not included and had to purchase some. Parking next to chalet. Games room had wi-fi which is not available in chalet. Lots of suitable toys in games room for our 1year 2 month old granddaughter which was a nice surprise. Views from chalet to die for especially at sunset. Nearest Restaurant/bar a short walk away..remember torch if dark.There is a torch in the chalet. All in all would definatley recommend. ten out of ten We will be booking in the near future again this time staying for longer. Hi there sorry to see that you did not enjoy your stay in our lodge. The lodge was booked for 2 people with no mention of a second bed needing made up so it was just the double bed that was fully made. You were provided with towels when you asked for them not sure what you mean re poor utensils as we have a full size cooker, fridge, 4 ring ceramic hob, microwave, kettle, toaster, enough cutlery, plates and glasses for 6 people. Steamer pot, 3 additonal pots, frying pan etc etc. perhaps you could clarify. Wifi is free and is provided in our reception hut free of charge 24/7. We are pleased to note that you enjoyed the location however. I will definitely be booking this back up. Beautiful cabins and beautiful location. I would definitely recommend to anyone going up get the best views. Thank you for your lovely reviewit is much appreciated. Cabins are clean and tidy and met our every need. Kids were free to run around, play games and generally be fun loving children. 45 min drive to Ben Nevis. Good pub 5 min stroll away. Although Wifi in games room could have had filtered wifi in cabins I.e. No video streaming but could access news websites. A mop to clean floor. Deeply disappointed, was very expensive, dirty. To be avoided. Location is maybe the only good thing, but there is a road right in front of the cottage, it does not show on the pictures. The pub nearby is the only good thing. The stay was a rip off. The alpine style cabin has a large window and a balcony to look out at the stunning view across Loch Creran. It has basic facilities but perfectly adequate and very good value for money. The family who run the holiday homes were extremely friendly and helpful. The Creagan Inn at the head of the loch is a short walk where we enjoyed good pub grub with an amazing view down the loch. We would have liked to have stayed longer. Magnificant vieuw over the lake. Bathroom is rather poor, no place to put anything away. Kitchen was ok, there could have been more knifes, forks, glasses and plates. No wifi in the house. 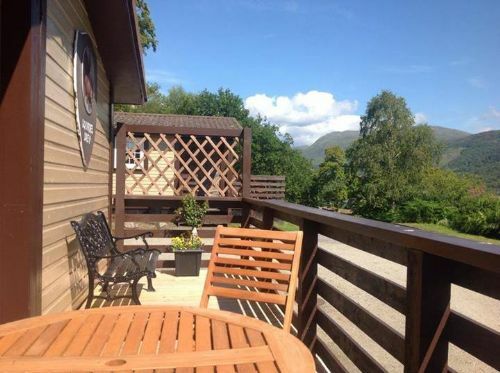 We would recommend Appin Lofges for a good value break amongst beautiful scenery. Lodges are well equipped and comfortable. The bedrooms are quite small but the beds are comfortable. The grounds are lovely although we only used it as a base for touring. The owners were very friendly and welcoming. Owners are very helpful and friendly. Cabins are good with great views across the loch. Loads to do on site and so much to visit in the local area. 2 nights was not enough. Can't go wrong with this place. long enough as there is so much to see and do around Oban. Helpful owner, reception area has wifi and good info for area, as does cottage itself. DVDs, games etc, all good. Cottage nice, TV/couches etc, bed could be a little more comfortable, kitchen etc functional doesn't really scream stay in and cook for a self-catering place (we stayed in a self-catering place in Loch Lomond with BBQ etc and stayed in a couple of nights). Good location, less than half hour from glencoe village, fort William about an hour away, access to the islands so a good base for 4-5 days. Castle stalker right beside. Really nice sitting outside in morning if weather good and beautiful view. A small number of midges about in evening but what are you going to do (pest spray, head covers). Would I recommend? If they had BBQ facilities and you felt more like cooking in there a couple of nights of your 4/5 night stay, then definitely as great view and great base. As it is, probably yes still but I'd look at options. Price a little on the high side. The sofas were not comfortable,slippy with no support and woke up with a bad back sometimes.overall holiday was fab.the location is the best.we were fortunate to have lovely weather and so glad we returned after 25 years. (we celebrated our honeymoon here and now our 25 th anniversary).it was better than we remembered. We had a great time at Appin Holiday lodges, great location so friendly couldn't have been more welcoming, definitely going back. Last minute booking as the cottage we had booked was flooded. Met by Jim who was very friendly and helpful. Location fantastic, comfortable, warm and cosy. Could not stop looking out of the window for the view. Was meant to be and loved it. Will definitely be back. Recently returned from a two night stay in Squirrel Drey lodge. The location is excellent with stunning views. We had a 5 year old with us who loved the playground and just the freedom to explore the old railway station and grounds around the lodge. Some beautiful beaches not too far away and the Creagan Inn a good place to eat. look forward to a return visit hopefully next year. The view from the chalet is outstanding. We enjoyed our stay. The bed linen was beautifully fresh and the kitchen is well equipped. The bathroom decor in the chalet is a bit tired with an old wiffy wiff... but hey everything can't be new all the time. Great views with beach nearby. Nice lodge on a great site - situated on an old railway station. Lodge was furnished to a good standard. A big U.S. Point was the brilliant views from the very large front window, overlooking the sea. A few small things that didn't significantly impact on the enjoyment of our stay... When we arrived the bin hadn't been emptied after the previous occupant. Difficult to use the oven as no oven glove provided. Disapointed with the children's play park and games room which were extremely run down. With some basic improvements these facilities could be a great addition to the site. We had a very enjoyable stay and would be happy to book again and to recommend to friends and family. Always fined this a lovely place to stay with lovely views over the loch. The site is well looked after tidy and clean. All lodges are well maintained. Had a wonderful stay here, perfect views out over the loch and was a good central base for us to go out and explore the area from Oban to Fort William and beyond. Accommodation was lovely, well furnished and comfortable. Would definitely stay here again and recommend to others. Nice house with pretty lake view. The outside facade of the house looks a little bit old but inside everything is renovated. We (family with 2 children: 9 and 13) were fully satisfied with staying there 3 nights. 15 miles to Oban – perfect seafood. Close to beautiful Glencoe – I highly recommend a visit. This lodge was ideally situated and the views are stunning. The lodge was fully equipped with everything necessary, however in some areas was beginning to look a little tired and in need of an update. The site was quiet, just as we expected, but was very different to the website information. The site in places looked scruffy, especially the games room which was in need of a refurbish and the old Creagan Station, which was stated as renovated and suitable for a picnic, was anything but. It was unfinished, with no picnic area. Whilst we had a fabulous holiday, with views to die for, we found it very expensive for facilities provided. the cotttage is on the lakeside with a beautiful view. the weir family are great hosts. a place to relax and enjoy scotland. the cabin is a perfect alternative if you are traveling with children. good place nice and clean for a good vacation. Nice place and location.friendly staffs.well presented home with all required facilities especially kitchen. Slightly over priced.no towels in bathroom.no mats in bathroom.was told to pay electricity bill initially though they didn't charge while checking out. Beautiful location, disappointed with the condition of lodge and customer service. Excellent location but lodge needs a bit of refurbishment. Very poor customer service. Did not see anybody on arrival or departure or for the 3 days while we were there. Basic amenities missing. Really disappointed with this review. A note was left in reception with our telephone number on it (we live on site) with instructions on how to get to lodge there are only 10 and have their names on them so not difficult. The lady obviously found note as I received a telephone call to say they required towels as they had not brought any. These were duly taken up to lodge. I was then informed that any hotel they had stayed at had provided towels I reminded them we were not a hotel and was then told there was nothing to wash hands with when I pointed out there was shampoo, conditioner, shower gel and body lotion in the bathroom the lady was still not satisfied as there was no liquid soap. Offering to get her some from my house she stated no dont worry ill get some tomorrow. There is a fully personalised welcome folder in each lodge with clear instructions on where we live. So the comment about not seeing anybody is completely untrue. We are glad she liked the location as do all our guests we have 60% returning customers year on year so aren saddened to hear she did not like the lodge. Bit reluctant to say as I don't want it to be booked up when we want to go again! A really well equipped lodge in a great and surprising location. We had never been to Appin before but would love to go again. Could not be bettered really. Very relaxing time with friendly help from Jim, the owner, if we needed anything. Tremendous value for money, we will go again and tell others about it.